Most of the libraries will be using the funds to purchase large print books, and books on CD; both offerings having been found to be popular with local senior citizens. The Berkshire Free Library will be using their funds toward painting the exterior of the building. Several senior citizen clubs in Tioga County also received money. 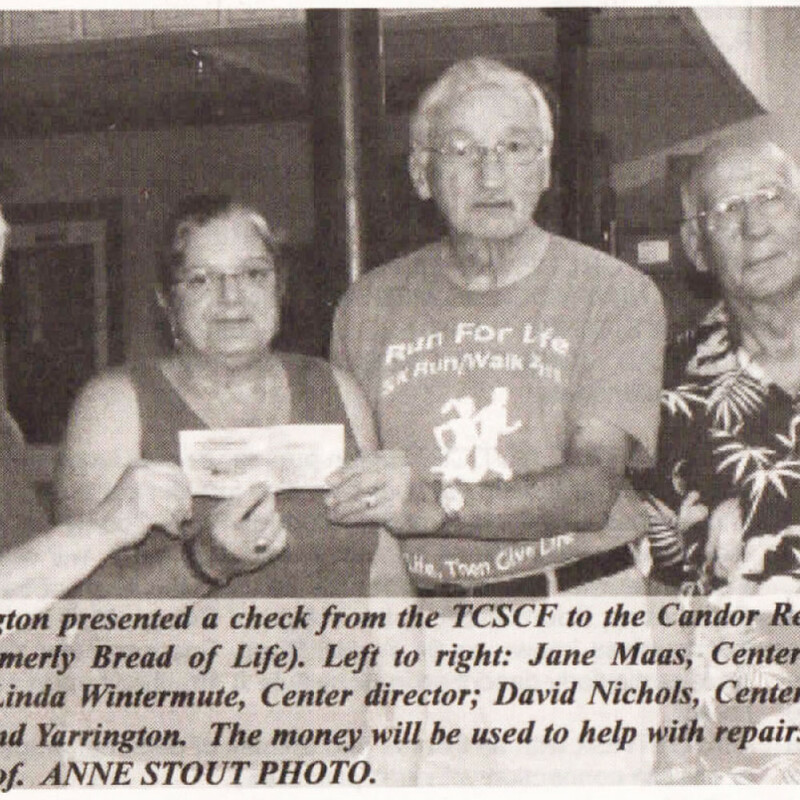 The Barton club received a check to help with meals and entertainment. The Golden Age Club in Owego received a check to help with rent at the Grange Hall. Newark Valley Club received a check to help with hall rent, supplies and meals. Owego Senior Club applied for funds for the use of the building, set-up and clean-up, drinks and entertainment. The Waverly Club received funds to help with scholarship, donations to charities, entertainment, kitchen supplies, and to defray the cost of banquets. Candor Community Services Corporation to underwrite “Tai Chi for arthritis/Fall prevention” program. Carantouan Greenway to establish gardens on the premises of senior living and long-term care facilities in Waverly. Catholic Charities Tompkins/Tioga Outreach for emergency financial assistance for seniors like heating fuel, electric shutoff, appliance replacement, etc. Community Care Network in Nichols for volunteer transportation reimbursement support, insurance to protect volunteers and the revamping of the Volunteer Transportation Program. Northern Tioga Neighbors Network for ongoing volunteer support services. Owego Seniors Paint Class to purchase paint for the classes at the Commmunity Center in Owego. Resource Center of Candor to help repair and paint the metal roof on the building. Ti-Ahwaga Community Players to purchase supplies and services to build emergency exit handicapped ramp on the south side of the building. Tioga County Council on the Arts to help sponsor “Always on Sunday” concert series. Tioga County Neighbors Helping Neighbors for training sessions for organizations serving vulnerable population. Tioga County Open Door Mission to help provide food assistance, food delivery to shut-ins, prescription and medical help, transportation, utilities, car and home repairs, gas cards, clothing, furniture and housing emergencies. Tioga County Rural Ministry to assist seniors who need food, financial assistance like rent, fuel, utilities, phone, home repair, car maintenance, medical prescriptions and more. Tioga Opportunities (Department of Aging) for volunteer mileage reimbursement, personal emergency response program costs, and offset cost of printing/mailing “Senior Scoop” newsletter. Tioga Opportunities Dept of Community Services with food banks and soup kitchens, and the Group work camps to help offset cost of materials. The Tioga County Senior Citizen Foundation was established in 1982 with funds from the sale of Owego Home for Aged Women which, for decades, provided care for elderly women in a home on Front Street in Owego. Since 1982 a total of $1,918,237 has been awarded for grant requests.